Islamabad – January 28, 2010: Ufone & Pepsi concluded ‘Badal do Qismat’, a joint promotion and finally announced the winner of the Grand Prize of this campaign. 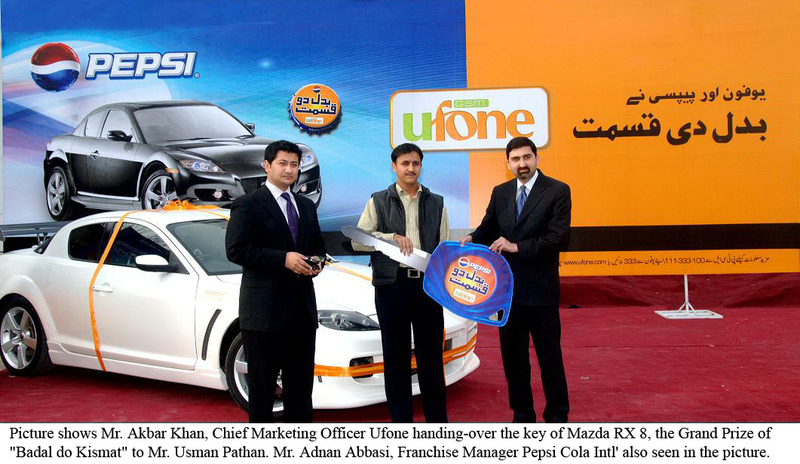 Usman Pathan, a resident of Sukkur was declared winner of the Grand Prize “Mazda RX 8” at an event held at Pepsi Head Office Lahore and the key was handed over at Ufone Head office in Islamabad. This offer was the first of its kind between one of Pakistan’s leading cellular service provider and leading carbonated soft drink brand in Pakistan received overwhelming response from the market. Consumers from around the country won exciting prizes including Free Talk Time, SMS’s, Cricket Bats, X Box’s, T-shirts and Free Pepsi. Senior management of Ufone’s & Pepsi Cola International was present at the occasion which included Mr. Akbar Khan, Chief Marketing Officer, Mr. Moazzam Ali Khan, Head of Public Relations & Corporate Social Responsibility & Mr. Khurram Mahboob, Manager Marketing from Ufone. While Mr. Adnan Abbasi, Franchise Manager & Mr. Mukarram Ali Khan, GM Sales Haidri Beverages and Northern Bottlers represented Pepsi Cola International.